To every season, if not every climate, there is a Salvia in bloom. So turn, turn to the flowers you love for inspiration about how to bring the beauty of nature indoors. In warmer climates, it is possible to celebrate nature year round with the color and fragrance of ornamental sages in fresh floral arrangements. Elsewhere, fresh bouquets are possible from spring through late autumn. 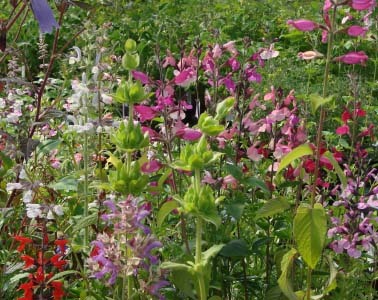 This is due to the wide variety of the Salvia genus and the lengthy bloom seasons of many species. You don’t have to be a florist to create eye-catching designs with dramatic sages. By planting the right ones -- along with complementary flowers -- in your garden and by gaining a little knowledge about color combinations, well-balanced composition, simple tools and cut-flower preservation, you are on your way. Selecting Salvias for Every Season. Searching for Salvias based on color, bloom season, USDA Zones or other attributes is easy at Flowers by the Sea. Just access our Salvia Finder, which can filter for all those characteristics in a single search. Or visit the menu on our homepage for categories matching those traits and other attributes, such as ease of growth and plant origins. As you prepare to turn the soil for new woody and herbaceous perennials, survey the Salvias and companion plants in your garden. Then select others to extend bloom throughout your growing season. That way, you may be able to keep vases and flower bowls full of beauty almost year round. Here are some suggestions. Often, what seems simple is actually complex. For example, a minimalistic bouquet of Salvia dorisiana and Iris japonica is a powerful combination not only due to the plants’ sharp contrasts but also because S. dorsiana has the heady fragrance of fruit juice. Pairing them in a drinking glass is fine idea. Better known as Fruit-Scented Sage, S. dorisiana has magenta-pink blossoms and large, fuzzy, green leaves as opposed to the smooth green blades and large purple, butterfly-shaped flowers of Japanese iris. You can cool off the burning crimson blaze of Red Velvet Mountain Sage by pairing it with Salvia BODACIOUS™ ‘Rhythm and Blues’, which smells like black licorice — a fragrance also called anise. Both Red Velvet Mountain Sage and Rhythm and Blues Anise-Scented Sage grow up to 4’ tall, so they provide long stems for a tall bouquet. Whereas Rhthym and Blues needs full sun to partial shade, Red Velvet thrives in partial to full shade. Combine them with yellow Fern Leaf Yarrow (Achillea filipendulina) to create a vibrant primary-hued arrangement. With its abundance of intense purple-black blossoms, Anthony Parker Bush Sage is a darkly dramatic companion in floral arrangements with the creamy white blossoms of Texas Wedding Sage (S. greggii ‘Texas Wedding’) and the lush red flowers of Diablo Eyelash Sage (S. blepharophylla ‘Diablo’). All are short to medium height and grow well in full sun to partial shade. If you live in warmer climes, this extravaganza of colorful trumpet blossoms might still attract hummingbirds in autumn. It will definitely provide bouquets to remember. Red Velvet Sage begins blossoming in summer and doesn’t give up until at least late autumn. Its fiery orange-red flowers and stems lend heat to floral arrangements at Thanksgiving and, perhaps, beyond. For a really hot mix, add Red Velvet Sage to Roseleaf Sage (S. involucrata ‘Bethellii’) and Lion’s Ear (Leonotis leonurus), a shaggy orange flower. All are members of the mint family, with Lion’s Ear being part of the catnip clan. Heleniums, which are relatives of sunflowers, also offer an array of warm oranges, yellows and reds in late autumn to add to a Red Velvet Sage arrangement. All of these potential Salvia arrangements lead to a central question in flower arranging: how to select color combinations. As you choose seasonal materials for arrangements, including foliage from bushes, try not to succumb too easily to rules. Remember that experimentation is the mother of pleasing surprises. Choosing Color Combinations. One method for arranging flowers is to focus on color schemes based on color wheel theory. Four standard approaches involve monochromatic, complementary, related and primary color combinations. A monochromatic arrangement might include Salvias and companion flowers in a range of blues. In contrast, a complementary arrangement might combine a primary color, with an unrelated secondary color, such as yellow flowers paired with purples — a mixture of primary red and blue. A combination of purple and red is an example of related colors. Finally, an arrangement that combines yellow, blue and red flowers is said to be primary. Creating Well-Balanced Compositions. Two basic shapes of flower groupings that work well for Salvias are triangular and vertical arrangements. In a triangular composition, the width of a bouquet usually is shorter than its height. The focal Salvias might be the tallest stems placed at the center of the composition and surrounded by other flowers cut to gradually decreasing lengths to create sloped sides. A vertical arrangement of distinctly upright flowers might be triangular or based on no particular geometric shape. Seeking Simple Tools. For natural-looking salvia arrangements, a simple way to support stems is to place glass marbles or beads at the bottom of a container to grip the base of the stems. Supports to use in a shallow bowl or teacup include glass or ceramic “frogs,” which contain holes into which stems are inserted. Frogs are particularly helpful in creating light, airy arrangements. Formal vases and shallow glass or ceramic bowls for flower arranging often can be found in thrift shops and at yard sales. While searching for vases and bowls, consider other containers such as tall drinking glasses and sturdy canning jars. Some of the most artful flower vases are actually old glass, metal or ceramic pitchers. You also need sharp garden shears and a bucket filled with water when harvesting flowers and foliage for arrangements. Preserving Beauty. Fresh-cut flowers will fade no matter what. However, it is possible to prolong their beauty, in part, by using floral preservative — a combination of sugar, an acidifier to improve pH and an antimicrobial substance -- such as a tiny bit of bleach -- for discouraging bacterial growth. Before placing the flowers in their container snip the bottoms of their stems again and strip any leaves off that will rest below the water line. Refresh the water and snip the stem bottoms again in a few days. Getting Started. Don’t fear mistakes in flower arranging; just get out there and snip those Salvias and anything that you think would look fine with them. Wander into your garden bravely with shears and water-filled bucket in hand and with hopes for a masterpiece in your heart. If you have questions about our plants or want to share photos of plantings or arrangements, please contact us at FBTS.